It’s Memorial Day Sunday and I don’t have any plans today. In fact, most of this weekend is going to be relaxing and simply enjoying time to myself. I’m going to a house party tomorrow which will be “potluck “style so I’m unsure what will be available. In the event that burgers won’t be on the menu, I decided to give in to my burger craving today. I was going to buy some ground turkey meat and make my own patties, but I opted to get oven ready free-range “Steakhouse-style” turkey burgers from Whole Foods on South Street; stuffed with green onions and various spices, it certainly sounded up my alley. While I was grilling the burger on the stove-top grill (medium), I went to work on making a spicy, lemony mayo and sliced a red onion, Roma tomato, and avocado. Once the burger was done, I began to assemble the ultimate turkey burger! I slathered the mayo on an organic, whole wheat bun then put a few rings of red onion on the bottom, laid the burger on top of that, then smeared some soft (chevre) goat cheese on the burger, and laid slices of the avocado and tomato on top of that. 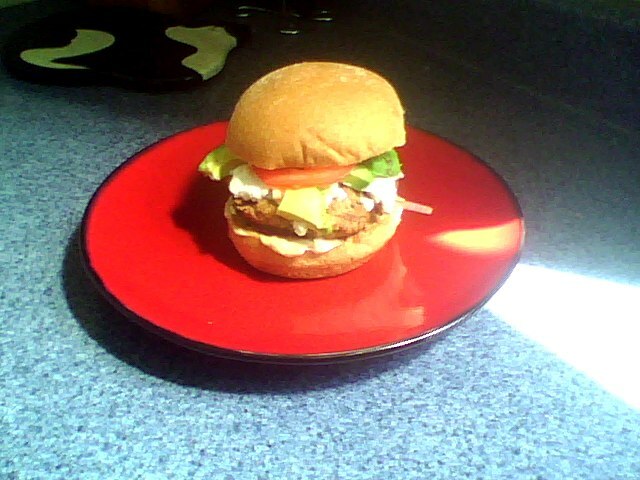 Tags: avocado, goat cheese, roma tomato, spicy mayo, turkey burger. Bookmark the permalink.